Fear of hackers reading private emails in cloud-based systems like Microsoft Outlook, Gmail or Yahoo has recently sent regular people and public officials scrambling to delete entire accounts full of messages dating back years. What we don’t expect is our own government to hack our email—but it’s happening. Federal court cases going on right now are revealing that federal officials can read all your email without your knowledge. The federal government is getting access to the contents of entire email accounts by using an ancient procedure—the search warrant—with a new, sinister twist: secret court proceedings. The earliest search warrants had a very limited purpose—authorizing entry to private premises to find and recover stolen goods. During the era of the American Revolution, British authorities abused this power to conduct dragnet searches of colonial homes and to seize people’s private papers looking for evidence of political resistance. To prevent the new federal government from engaging in that sort of tyranny, special controls over search warrants were written into the Fourth Amendment of the Constitution. But these constitutional provisions are failing to protect our personal documents if they are stored in the cloud or on our smartphones. Fortunately, the government’s efforts are finally being made public, thanks to legal battles taken up by Apple, Microsoft, and other major companies. But the feds are fighting back, using even more subversive legal tactics. To get these warrants in the first place, the feds are using the Electronic Communications Privacy Act, passed in 1986—long before widespread use of cloud-based email and smartphones. That law allows the government to use a warrant to get electronic communications from the company providing the service—rather than the true owner of the email account, the person who uses it. You might never know that the government has been reading all of your email—or you might find out when you get charged with a crime based on your messages. Microsoft’s suit, filed in Seattle, says that over the course of 20 months in 2015 and 2016, it received more than 3,000 gag orders—and that more than two-thirds of the gag orders were effectively permanent, because they did not include end dates. Court documents supporting Microsoft describe thousands more gag orders issued against Google, Yahoo, Twitter and other companies. Remarkably, three former chief federal prosecutors, who collectively had authority for the Seattle region for every year from 1989 to 2009, and the retired head of the FBI’s Seattle office have also joined forces to support Microsoft’s position. 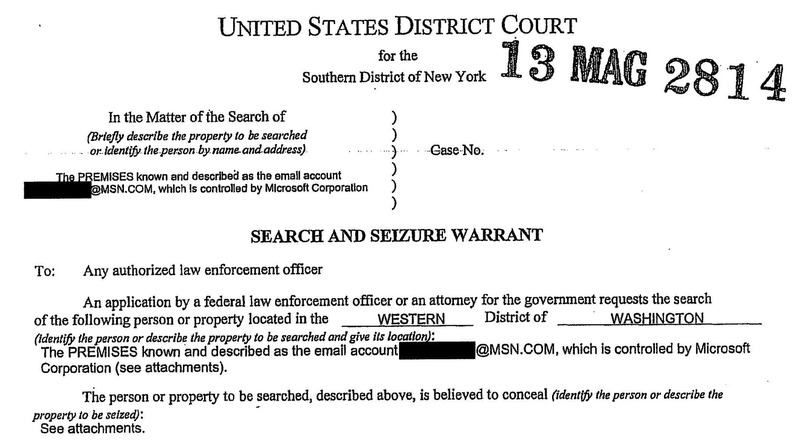 It’s very difficult to get a copy of one of these search warrants, thanks to orders sealing files and gagging companies. But in another Microsoft lawsuit against the government a redacted warrant was made part of the court record. It shows how the government asks for—and receives—the power to look at all of a person’s email. In warrants like this, the government is deliberately not limiting itself to the constitutionally required “particular description” of the messages it’s looking for. To get away with this, it tells judges that incriminating emails can be hard to find—maybe even hidden with misleading names, dates and file attachments—so their computer forensic experts need access to the whole data base to work their magic. Former federal computer-crimes prosecutor Paul Ohm says almost every federal computer search warrant lacks the required particularity. Another former prosecutor, Orin Kerr, who wrote the first edition of the federal manual on searching computers, agrees: “Everything can be seized. Everything can be searched.” Even some federal judges are calling attention to the problem, putting into print their objections to signing such warrants—but unfortunately most judges seem all too willing to go along. If Microsoft wins, then citizens will have the chance to see these search warrants and challenge the ways they violate the Constitution. But the government has come up with a clever—and sinister—argument for throwing the case out of court before it even gets started. For example, in the case of U.S. v. Ravelo, pending in Newark, New Jersey, the government used a search warrant to download the entire contents of a lawyer’s personal cellphone—more than 90,000 items including text messages, emails, contact lists and photos. When the phone’s owner complained to a judge, the government argued it could look at everything (except for privileged lawyer-client communications) before the court even issued a ruling. Where does this all leave us now? The judge in Ravelo is expected to issue a preliminary ruling on the feds’ arguments sometime in October. The government will be filing a final brief on its motion to dismiss the Microsoft case September 23. All Americans should be watching carefully to what happens next in these cases—the government may be already watching you without your knowledge.